Featured Photo: Gov. Kenneth Mapp speaks to Patrice Harris and Nathalie Trow-McDonald about job opportunities at the NABJ founders’ reception in Washington, D.C. (photo courtesy of Bevan Springer). Last weekend the V.I. Tourism Department sponsored two local university students to attend the first joint convention of the National Association of Black Journalists and National Association of Hispanic Journalists in Washington, D.C.
For the last six years, Tourism has been a corporate sponsor for the annual NABJ convention in an effort to bring a more culturally diverse pool of tourists to the territory. As a communications student at the University of the Virgin Islands entering my junior year, I was invited to attend the meeting along with Patrice Harris, a recent UVI communications graduate who spoke at the school’s St. Thomas 2016 commencement ceremony. Attending the meeting was an opportunity to expand our career horizons and learn from minority journalists. “It was a strategic decision to strengthen the territory’s outreach to multicultural markets and especially the African American community,” explained Beverly Nicholson-Doty, Tourism commissioner. This is the third consecutive year that university students have joined the V.I. delegation to represent the territory at the meeting and showcase its young talent. Nicholson-Doty said Tourism continues to work with NABJ because it’s a great venue to showcase all the Virgin Islands has to offer to people who can spread the word. Steel pans, soca music and a mocko jumbie gave attendees a taste of the Virgin Islands during a special evening event hosted by Tourism. Amber Sizemore of the SpeakEasy M.E.D.I.A. Foundation, left presents scholarships to Nathalie Trow-McDonald and Patrice Harris at the NABJ Salute to Excellence Gala (photo courtesy of Bevan Springer). Governor Kenneth Mapp gave a speech at the NABJ Founders’ Reception held in the new Smithsonian National Museum for African American History and Culture slated to open in September. Following Mapp’s speech, Nicholson-Doty gave out prizes that included three-night stays at local hotels in both St. Thomas and St. Croix, as well as airfare to the islands on any date of the winner’s choosing. Throughout the event Ryan Joseph, a trumpet player from St. Croix, and his jazz band. Due to our association with the Tourism Department, Harris and I received tickets to see Democratic presidential nominee Hillary Clinton speak, as well as a special sneak-peak of the new museum. A number of inspirational journalists spoke, including Jarrett Hill, who discovered the similarities between Melania Trump’s Republican National Convention speech and a speech given previously by First Lady Michelle Obama. And several famous authors held meet and greets, such as actor and author Hill Harper. The conference extended beyond news media: Harris and I attended one of the first screenings of the upcoming Disney movie, “Queen of Katwe,” which included an exclusive question and answer session with one of the main actresses, Lupita Nyong’o. Other movies screenings that star black people included “Loving,” “Hidden Figures,” “Southside with You” and “Birth of a Nation.” Conference attendees were also introduced to Disney’s first Latina princess, Elena of Avalor. Workshops that gave us tips to become better multimedia journalists were interspersed between lectures, and a career fair offered opportunities for potential internships and job positions. At the end of the annual NABJ Salute to Excellence Gala, Harris and I were each awarded a $500 scholarship by the Speak Easy M.E.D.I.A. Foundation, which was created to provide scholarships to youth in the United States and the Caribbean interested in pursuing a career in the field of communications. 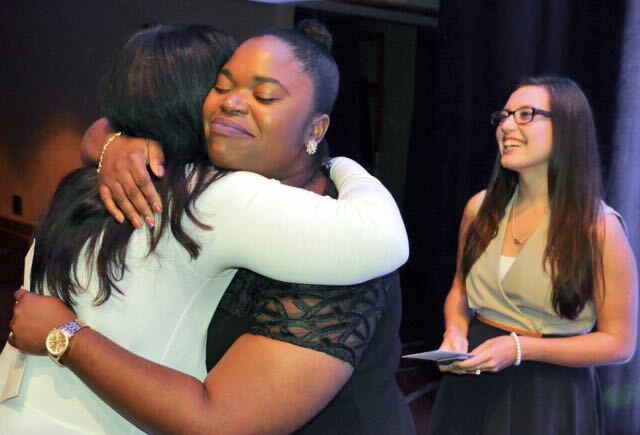 Harris received her scholarship in tears, knowing how proud her late father would be of her accomplishments. Currently UVI has a four-year bachelor’s degree program in Communications as well as its own student run media outlets, including a radio station, WUVI AM-1090/97.3 FM, and an online newspaper, The Voice. There are plans in the making to establish an NABJ Student Affiliate chapter at UVI.